For the Transformers character, see Smokejumper (Transformers). A smokejumper is a wildland firefighter who parachutes into a remote area to combat wildfires. Smokejumpers are most often deployed to fires that are extremely remote. The risks associated with this method of personnel deployment are mitigated by a training program that has been developed over more than 70 years. Smokejumpers are capable of reaching a wildfire shortly after ignition, when it is still relatively small, and extinguishing the blaze before it becomes a problem to land managers and the public. When there is no significant fire activity, smokejumpers will take on other assignments such as forestry, disaster relief and emergency management. Smokejumpers are employed in large numbers by the Russian Federation and the United States Forest Service and Bureau of Land Management. Russia maintains more smokejumpers than any other nation in the world (several thousand) and claims the longest history of established smokejumping of any nation (reportedly established in 1936; smokejumping in the United States was established in 1939). Prior to the full establishment of smokejumping, experiments with parachute insertion of firefighters were conducted in 1934 in Utah and in the Soviet Union. Earlier, aviation firefighting experiments had been conducted with air delivery of equipment and "water bombs." Although this first experiment was not pursued, another began in 1939 in Washington's Methow Valley, where professional parachutists jumped into a variety of timber and mountainous terrain, proving the feasibility of the idea. This also saw the first Forest Service employee jumper, Francis Lufkin, who was originally hired as a climber to extract the professional parachutists from the trees. It is believed that he made this first jump on a dare from the parachutists. The following year, in 1940, permanent jump operations were established at Winthrop, Washington, and Ninemile Camp, an abandoned Civilian Conservation Corps camp (Camp Menard) located a mile north of the Forest Service's Ninemile Remount Depot (pack mule) at Huson, Montana, about thirty miles northwest of Missoula. The first actual fire jumps in the history of smokejumping were made by Rufus Robinson and Earl Cooley at Rock Pillar near Marten Creek in the Nez Perce National Forest on July 12, 1940, out of Ninemile, followed shortly by a two-man fire jump out of Winthrop. In subsequent years, the Ninemile Camp operation moved to Missoula, where it became the Missoula Smokejumper Base. The Winthrop operation remained at its original location, as North Cascades Smokejumper Base. The "birthplace" of smokejumping continues to be debated between these two bases, the argument having persisted at this time for approximately 70 years. The first smokejumper training camp was located at the Seeley Lake Ranger Station, over sixty miles northeast of Missoula. The training relocated to Camp Menard in July 1943. Here, when not fighting fires, the men spent much time putting up hay to feed the hundreds of pack mules that carried supplies and equipment to guard stations and fire locations. In order to work fires, men, organized into squads of eight to fifteen, were stationed at six strategic points, also known as "spike camps": Seeley Lake, Big Prairie and Ninemile in Montana; Moose Creek and McCall in Idaho; and Redwood Ranger Station in southwestern Oregon at the edge of Cave Junction. The men worked from other spike camps as well, including some in Washington State. After observing smokejumper training methods at Seeley Lake in June 1940, then-Major William C. Lee of the U.S. Army went on to become a major general and establish the 101st Airborne Division. In May 1978, members of the Army National Guard's 19th Special Forces Group (Airborne) and other Western military units briefly began airborne training at the Missoula Smokejumper School. Although in years past the Army had conducted basic Airborne training at various locations, it has since been consolidated at Fort Benning, Georgia. Approximately 240 workers from Civilian Public Service camps, mostly conscientious objector draftees from historic peace churches, worked as smokejumpers during World War II. An initial group of 15 men began training in parachute rigging in May 1943 at Seeley Lake, and a total of 33 completed jump training in the middle of June, followed by two weeks of intense training in fire ground control and first aid. Approximately 500 training jumps were made by the first 70 CPS smokejumpers in 1943, who went on to fight 31 fires that first season. Their number increased to 110 in 1944, and to 220 in 1945, as more equipment became available from the War Department. Twenty-nine jumpers battled the remote Bell Lake fire in September 1944, among 70 fires suppressed that year, and 179 were fought in the Missoula Region alone by September 1945, with other jumpers assigned to McCall and Cave Junction. The last CPS smokejumper left the service in January 1946. 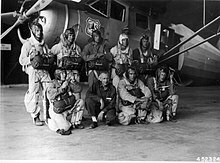 The 555th Parachute Infantry Battalion gained fame as the only entirely black airborne unit in United States Army history. The 555th was purportedly not sent to combat because of segregation within the military during World War II; however, in May 1945, it was sent to the west coast of the United States to combat forest fires ignited by Japanese balloons carrying incendiary devices, an operation designated Operation Firefly. Although this potentially serious threat did not fully materialize, the 555th fought numerous other forest fires while there. Stationed at Pendleton Field, Oregon, with a detachment in Chico, California, 300 unit members participated in dangerous firefighting missions throughout the Pacific Northwest during the summer and fall of 1945, earning the nickname "Smoke Jumpers". The 555th made a total of 1200 jumps to 36 fires, 19 from Pendleton and 17 from Chico. In the interim, the Smokejumper Project had become a permanent establishment of the USFS in 1944. In 1946, the Missoula Region had 164 smokejumpers, 84% of them military veterans, many of them also college students, who eventually constituted 40% of the smokejumper ranks in the post-war years. New bases were opened in Grangeville, Idaho, and West Yellowstone, Montana. Most smokejumpers of the era were not career professionals but seasonal employees lured by the prospect of earning as much as $1,000 over a summer. They were assigned jobs from a rotational list, for which there was keen competition. They tended to be well-behaved, self-motivated, and responsible, since breaches of discipline meant loss of one's spot on the rotation, and a violation of law resulted in dismissal from the project altogether. As a result, they were not expert firefighters, but were well-trained in the skills of preventing small fires from becoming large ones, and often worked minor fires in pairs. Squad-sized and larger crews were supervised by foremen who were career USFS firefighters and experts in all types of wildfires. The fire with the most line-of-duty smokejumper deaths was the Mann Gulch fire in 1949, which occurred north of Helena, Montana, at the Gates of the Mountains area along the Missouri River. Thirteen firefighters died during the blowup, 12 of them smokejumpers. This disaster directly led to the establishment of modern safety standards used by all wildland firefighters. Noted author Norman MacLean described the incident in Young Men and Fire (1992). Despite the seemingly dangerous nature of the job, fatalities from jumping are infrequent, the best-known fatalities in the United States being those that occurred at the Mann Gulch Fire in 1949 and the South Canyon Fire in 1994. Jump injuries are infrequent, and smokejumper personnel take deliberate precautions before deciding whether to jump a particular fire. Multiple factors are analyzed, and then a decision is made as to whether it is safe to jump the fire. Bases tend to look for highly motivated individuals who are in superior shape and have the ability to think independently and react to changing environments rapidly. Many smokejumpers have previous experience as hotshots which provides a strong foundation of woodland fire experience and physical conditioning. There are currently nine smokejumping crews in the United States, seven of which are operated by the United States Forest Service and two by the Bureau of Land Management. These Crews are as follows: Redmond Smokejumpers (USFS), North Cascades Smokejumpers (USFS), Redding, CA Smokejumpers (USFS), Missoula Smokejumpers (USFS), Grangeville Smokejumpers (USFS), West Yellowstone Smokejumpers (USFS), McCall Smokejumpers (USFS), Boise Smokejumpers (BLM) and Alaska Smokejumpers (BLM). The British Columbian Parattack Program is currently the only program to operate smokejumpers in Canada. The Parattack Program currently has only one crew, the North Peace Smokejumpers. The minimum required physical fitness standards for smokejumpers set by the National Wildfire Coordinating Group are: packout 110 pounds for 3 miles within 90 minutes, run 1½-miles in 11:00 or less, 25 push-ups in 60 seconds, 45 sit-ups in 60 seconds, and 7 pull-ups. The 1952 film Red Skies of Montana is based in part on the 1949 Mann Gulch disaster. In the television show Entourage, Vincent Chase lands a lead role in an action film called Smokejumpers. Author Nora Roberts's April 2011 novel Chasing Fire is set among the "Zulies" of the Missoula Smokejumper Base. Author M. L. Buchman's Smokejumper trilogy in his Firehawks series follows a team of fictitious Oregon-based smokejumpers. They are also featured in the 1985 novel Wildfire by Richard Martin Stern, the 1989 Steven Spielberg film Always, the 2002 made-for-television movie SuperFire, and the 1998 film Firestorm, the latter two of which were critically panned for their wild inaccuracies in depicting the profession. Smokejumpers are described in Philip Connor's 2011 book Fire Season. Author Nora Roberts's 2011 novel Chasing Fire also details the lives and loves of a group of smokejumpers. The 1996 film Smoke Jumpers is loosely based on Don Mackey's life. 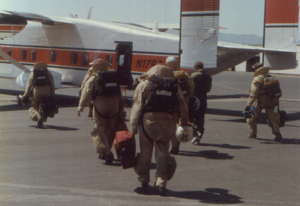 Mackey was a smokejumper and one of the fourteen fatalities on the 1994 South Canyon fire. In the movie he pursues job-related accolades and excitation while his marital relationship grows estranged. In the 2008 TV movie Trial By Fire, Kristin Scott attempts to join the smokejumpers after her father's death in a house fire a day before he retired from duty. The Disney film Planes: Fire and Rescue, includes Regina King, Corri English, Bryan Callen, Danny Pardo, and Matt L. Jones who play Smokejumpers based out of Piston Peak Air Attack base. Alaska Smokejumpers were prominently featured in the 2015 Weather Channel documentary Alaska: State of Emergency, hosted by Dave Malkoff. The lead character in Marlow Briggs and the Mask of Death, a video game developed by ZootFly and Microsoft Studios, is a smokejumper. Spotfire Images: Quality Smokejumper and Fire Photos. This page was last edited on 21 January 2019, at 00:08 (UTC).